Whisk together olive oil, balsamic vinegar, rosemary and mustard; set aside. Make small incisions all over lamb and insert garlic slices. Rub olive oil mixture all over lamb. Sprinkle with salt and pepper. Transfer to roasting pan fitted with rack. Add onions; pour 1 cup water into bottom of pan. 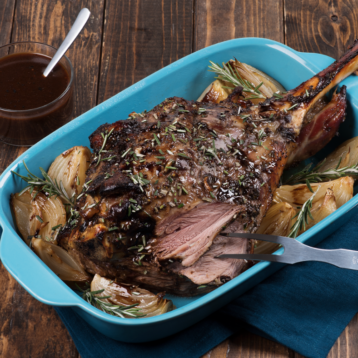 Roast for 80 to 90 minutes or until internal temperature reaches 60°C for medium-rare, adding water to pan as needed to avoid scorching and onions from drying out. For Gravy: Place roasting pan on stove top over medium-high heat; stir in flour. Whisk in wine; boil for 1 to 2 minutes or until reduced by half. Whisk in chicken stock and balsamic vinegar. Add rosemary; bring to boil and simmer for 8 to 10 minutes or until thickened. Season with salt and pepper. Serve with lamb. Serve with roasted mini red potatoes and sautéed spinach.